Systems that consist of printed circuit boards with various digital and analog components, connecting wires and metal enclosures can show complex electromagnetic behaviour. A model is reviewed that allows for the calculation of the most important contribution to the emitted radiation from such systems. In this model the radiation is driven by common-mode voltage sources. The physical origin of these voltage sources is explained and the relevant electric field integral equation is derived. 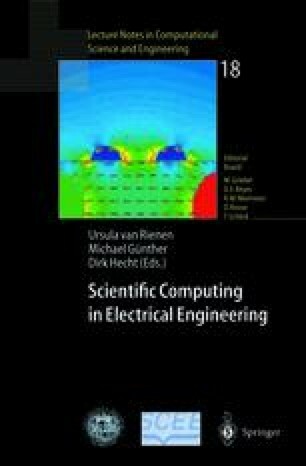 When planes are discretized by wire grids, the resulting equations can be analysed by means of a program like NEC. A program similar to NEC, named BERBER, is presented. See e.g., The unofficial Numerical Electromagnetic Code (NEC) Archives at http://www.qsl.net/wb6tpu/swindex.html. For an overview of iterative solution methods for linear equations see e.g., Saad, Y. and H. van der Vorst, Iterative Solution of Linear Systems in the 20-th Century, preprint available at http://www.math.uu.nl/people/vorst/ithistory.tgz, to appear in JCAM (2000).